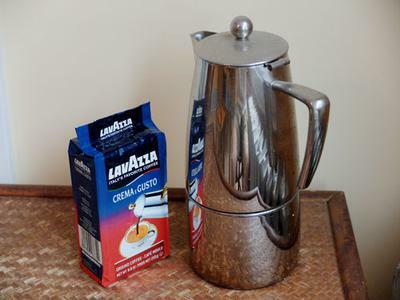 Can I use espresso coffee in my automatic drip coffee maker? It is much cheaper! First off, my apologies for the very slow response. No excuse really, other than being super-busy. You have a couple of questions here. One about using espresso coffee in a drip brewer. And one about the price of coffee. Let’s tackle the price issue first. If you’re talking about espresso coffee being cheap, I’m guessing you’re looking at the blocks of ground espresso coffee like the one you see in the picture above. And yes, you can often find these at a surprisingly low price. But generally, “espresso” coffee is the same price as any other coffee. And as with regular coffee, you’ll usually pay more for the whole bean than for pre-ground. Keep in mind, there is no such thing as an “espresso bean”. Espresso is made with coffee beans, just the same as drip coffee. When a bean from a particular origin, or in a particular blend, is described as being for expresso, it’s just that the roaster figures that bean or blend would make good espresso. Just to confuse things, if you are shopping in a supermarket, you’ll often find the word espresso used on packaging to describe a coffee that is dark-roasted. This implies you should use only dark-roasted coffee to make espresso. Not true. But I digress. Put simply, other than deals on particular brands, coffee for an espresso machine is no cheaper than coffee for a drip brewer. As for the question about using espresso coffee in a drip brewer... no and yes. No, you should not use coffee that has been ground for making espresso. This is a much finer grind than you want for a drip brewer. In fact, your filter paper or screen will likely clog up and overflow if you use an espresso grind in a drip brewer. But if you are buying whole beans which have been described as “espresso” in some way, and you grind them yourself, to a medium grind, then yes, that would be fine. Comments for Can I use espresso coffee in an automatic coffee maker? I have been using espresso ground coffee in my drip machine for years Ethel great success. I’ve been considering a percolator but can’t find any info on if I can use espresso ground in the percolator. Has anyone ever tried it?